I have been trying to simplify my cooking and meal plans as much as possible lately so that I can still prepare a few meals a week though I’m on modified bedrest. The slow cooker is the only way I can accomplish this, and particularly with a dump and go type of recipe. I’ve also been trying to work through some of our stockpile in our freezer and pantry. 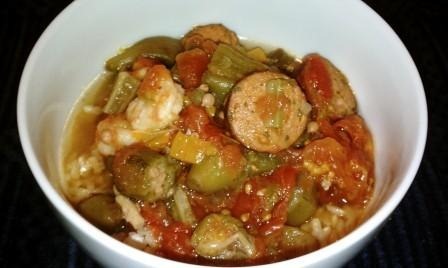 So I created this gumbo recipe based on what I had on hand, and it was a huge success. Everyone ate it up and had seconds, including my son! 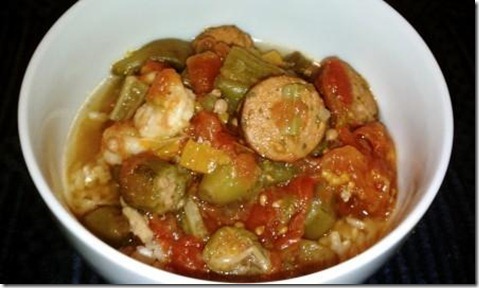 If you want a thicker gumbo, you could add make a roux to begin, saute the onion, bell pepper and okra for about 10 minutes before putting in the slow cooker or add some corn starch towards the end of the cooking period. 1. Put everything except the shrimp in the slow cooker. Turn on low for about 8 hours. 2. About 30 minutes before the gumbo is done, stir in the shrimp and allow to cook through, Remove bay leaves before serving.